West Zion Mennonite Church, Moundridge, Kansas. Dedication of new church building; previous building in background (1907). 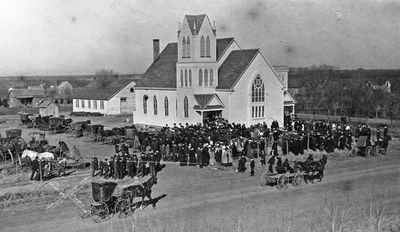 West Zion Mennonite Church (General Conference Mennonite Church), located in Moundridge, McPherson County, Kansas, a member of the Western District, was organized on 4 March 1888, by members from the First Mennonite Church of Christian (now Moundridge). Most of these first members had moved to Kansas from Lee County, Iowa, in the 1870s and named the new congregation after the mother church, the Zion Mennonite Church of Donnellson, Iowa. The names of the charter members were Galle, Rupp, Eymann, Ruth, Schowalter, and Krehbiel. William Galle was elected the first elder and served until his death in 1920, although he was assisted after 1909. The congregation first met in a schoolhouse, which was remodeled and enlarged in 1896. In 1907 a new church building was dedicated. A basement was added to this in 1937. That same meetinghouse, seating approximately 350, was in use in 1959. In 1957 the congregation had 266 members, approximately one third of whom lived on farms. The first families were mostly of South German ancestry. Today the congregation is heterogeneous in background, including members from various Mennonite and non-Mennonite groups. Men who have served as pastors of this congregation are William Galle, J. M. Suderman, J. P. Baehr, D. J. Brand, P. K. Regier, W. F. Unruh, John B. Graber, and Harris Waltner. Waltner, Harris. "West Zion Mennonite Church (Moundridge, Kansas, USA)." Global Anabaptist Mennonite Encyclopedia Online. 1959. Web. 21 Apr 2019. http://gameo.org/index.php?title=West_Zion_Mennonite_Church_(Moundridge,_Kansas,_USA)&oldid=163017. Waltner, Harris. (1959). West Zion Mennonite Church (Moundridge, Kansas, USA). Global Anabaptist Mennonite Encyclopedia Online. Retrieved 21 April 2019, from http://gameo.org/index.php?title=West_Zion_Mennonite_Church_(Moundridge,_Kansas,_USA)&oldid=163017. This page was last modified on 13 January 2019, at 18:35.